Heat oven to 375°F. Grease or spray cookie sheet. In 10-inch skillet, cook sausage and garlic over medium heat until no longer pink; drain. Stir in bell pepper. On cookie sheet, unroll dough and separate into 4 rectangles; press each into 7x4-inch rectangle, firmly pressing perforations to seal. Spread 1 tablespoon sauce on half of each rectangle to within 1 inch of edge. Sprinkle 2 tablespoons cheese over sauce; top with one-fourth of sausage mixture. Fold dough over filling; firmly press edges with fork to seal. Brush top of each with egg. With fork, prick top of each to allow steam to escape. Bake 15 to 20 minutes or until deep golden brown. Immediately remove from cookie sheet. Serve warm. Cheese Calzone: Omit sausage and vegetables. Use 2/3 cup cheese in each calzone. Shape and bake as directed above. 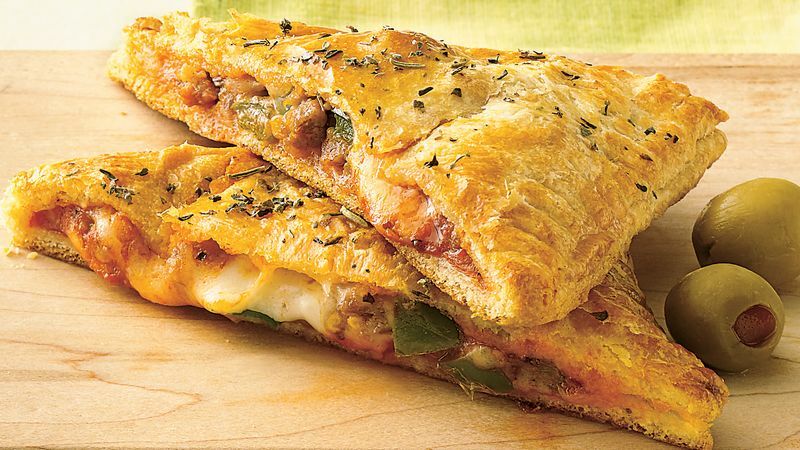 Pepperoni and Vegetable Calzone: Replace sausage with 1/2 cup diced or sliced pepperoni. Cook vegetables in oil; stir in pepperoni. Shape and bake as directed above. To reheat, wrap loosely in foil; heat at 350°F 20 to 25 minutes. For added flavor, sprinkle each calzone with Italian seasoning before baking.